BISDS has organized a Sanghika Dana on 5th August 2018 in Asoka Hall of BMV. This was the first program conducted by BISDS in the Asoka Hall after it was closed for upgrading and renovation works. Lead by their respective class teachers all the students walked orderly from GIIS to BMV, Asoka hall to participate in this meaningful ceremony. The children patiently seated to wait for the ceremony to begin. There were 42 Sangha members from various traditions participated in this ceremony. The objective of organizing this ceremony is to inculcate generosity and for the children of BISDS to experience the act of giving (dana). By organizing this, BISDS has provided the students the experience and the role of giving. The students were happily participating in the organizing as well as in performing all the task assigned to them. 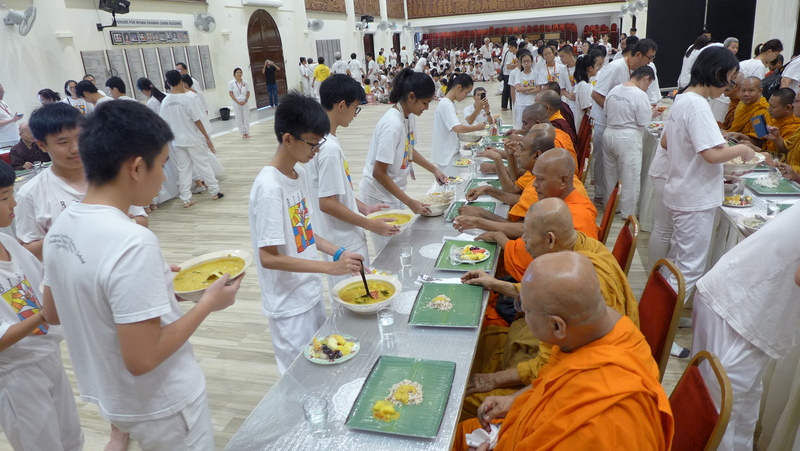 The teens were given the task of handling the preparation of food for the Sangha, taking on the responsibilities of the master of ceremony as well as being ushers. Lead by the project team, there were so much of teamwork as well as abundance of understanding, patience and comradeship seen amongst the working committee members, teachers, staff, students, parents as well BMV office personnel in performing their respective duties to ensure that the ceremony was a success. Congratulations and Thank you to each and every one in BISDS as well BMV. The ceremony started when all the invited Sangha members walked into the Asoka hall. BISDS principal lead the taking of 5 precepts followed with the words of encouragement and a thank you speech from the Chairman of Parent Body before the Chief Reverend gave his speech. Subsequently, all the Sangha from various traditions took their turn to chant following their traditions before the lunch was served. After the Sangha lunch, transference of merit was performed, lead by all the Sangha members and participated by all present. Subsequently, the students took their turn to offer dana to all the Sangha members.